What happens when Farmer Greenstalk’s pigs fancy themselves as a high-tech rescue team, rushing to help with every Greenstalk family problem? Pandemonium and mass hysteria! Anyone who enjoyed John Himmelman’s previous book, Chickens to the Rescue, will know to expect hilarious illustrations and deadpan narrative, but the results of a pig rescue squad are rather different than that of a chicken team. Brace yourselves! How can you resist the tag line “Yet Another Troll-Fighting 11-Year-Old Orthodox Jewish Girl”? Yes, really: this is a graphic novel about Mirka, an Hasidic Jewish girl who lives in the completely Orthodox town of Hereville. She also happens to want to fight dragons and monsters–she always has. Make no mistake, although Hereville is a fictional town, Mirka’s world is a very normal, realistic one; no one ever thinks that Mirka really WILL find dragons and monsters to fight. One of the great charms of the story is the portrayal of Mirka’s large blended family, and the daily interaction between her sisters, brother, and stepsister. Her stepmother (NOT wicked) Fruma is a particularly wonderful character in her own right. All of this domesticity notwithstanding, however, one day Mirka is running through the woods (fleeing some boys who she stopped from bullying her younger brother) and sees a woman flying through the air. Clearly this woman is a witch. It stands to reason! But nobody believes her about the witch, and REALLY nobody believes her about the enormous, talking pig that starts chasing her around town, causing her to behave in scandalous, unorthodox ways. In an effort to stop the pig from ruining her reputation, she sets out to trap the pig, encounters the witch again, and (naturally) ends up in a duel with a troll. And all of this with her brother Zindel constantly tagging along. This book is hilarious and delightful, both in the text–which teaches the reader quite a bit about Judaism, without being didactic–and in the pictures–which are in a deceptively simple style slightly reminiscent of early-20th century cartoons or advertisements. I saw an interview with the author, who intimated that there might be future volumes of Mirka’s adventures, and I can only hope he was telling the truth. 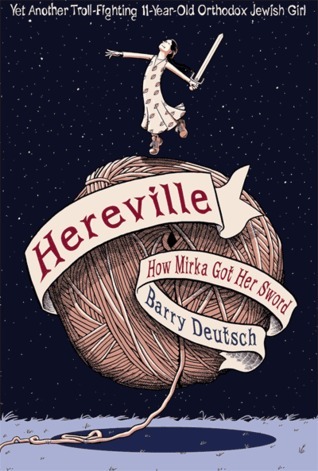 I’d love to read more about Hereville–after all, Mirka hasn’t even met a dragon yet. I’m going to go out on a limb and say that for most of us, Christmas is not the time for Edgy and Innovative. Not the time for Thrilling (of the Zip! Pow! variety) or Seat-of-Your-Pants Terrifying. Christmas (or any winter holiday, of course) is about comfort and cosiness and togetherness and safety. (I cannot deny the appeal of presents and food, but mostly: comfort). Most of us return to our childhood favorites at this time of year–A Christmas Carol, The Best Christmas Pageant Ever, A Child’s Christmas in Wales, Letters from Father Christmas, etc–and I am no different. Recently, though, I discovered a book that is destined to become someone else’s childhood favorite, the comfiest, cosiest, sweetest (and yet not saccharine!) 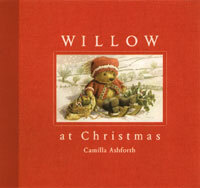 picture book: Willow at Christmas by Camilla Ashforth. The book tells the story of Willow the teddy bear, who is the farmer on Paradise Farm, where he takes care of Little Pink Pig, and various other animals. Over the course of the book, Willow hopes for snow for Christmas, feeds and takes care of the animals, wraps presents, decorates the house and cuts down a Christmas tree. The book culminates with Willow’s friends arriving for caroling and a (very British) Christmas Eve feast. 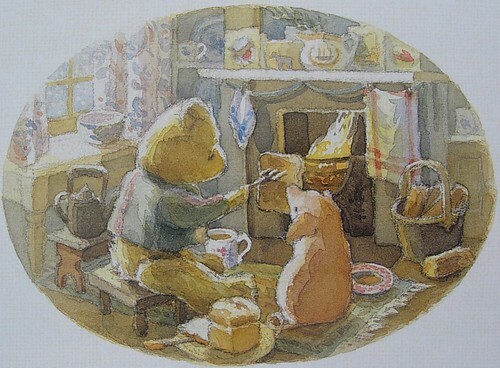 What makes the book truly endearing are the illustrations. The soft-focus watercolors are slightly reminiscent of late-period Beatrix Potter, and the minutia of Willow’s farm life bring to mind Jill Barklem’s Brambly Hedge books. Adorable without being cutesy, warm and quietly content, the book feels like a walk in the snow, ending with the lights of home. What a perfect time to read or reread this holiday classic! And… since it is being made into a new movie, I expect there will be renewed interest and excitement about the book which, by the way, is WONDERFUL! The story starts out by describing the Herdman family with their cussing, lying, stealing, hitting, dirty-talking, cigar-smoking children (even the girls). The Herdmans pretty much terrorize their school and their town on a daily basis. They are known far and wide, and not in a good way. In an effort to get rumored free desserts, they have volunteered to take part in the annual Christmas pageant. Well, with a little threatening and intimidation, they manage to land the very best roles in the pageant — Mary, Joseph, etc. Practically the whole town is up in arms with the prospect, especially Alice Wendleken who always plays Mary and Mrs. Armstrong who always runs the show, but this year promises to be like no other. Since the Herdman children have never really been taken to church, they aren’t at all familiar with this age old story and are very curious to say the least. They find reasons to question seemingly every part of the story, much to the surprise of the grown-ups and the other children. In the end, this unconventional telling makes us all really think about the true meaning of the Christmas story, and the Herdman children’s somewhat goofy, messy, LOUD interpretation really capture the true spirit of Christmas in a way that scores of Sunday school teachers could not. For such a skinny book, this story really packs a punch, undoubtedly thrown by one of the Herdman children. It brings back childhood memories of Christmas pageants (I was an angel by the way) and that one family in the school or the town that always seemed a little more unkempt and unruly than the rest. What a surprisingly wonderful little story! Fancy Nancy is a favorite of many little girls. This new addition to the series has Fancy Nancy and her classmates writing reports about their ancestors. Fancy Nancy talks to her grandfather to see if any of her ancestors were famous or had exciting adventures; she is disappointed to learn that they seemed quite ordinary (a fancy word for plain). While writing her report, she embellishes the truth to make her report more interesting. When she realizes that her grandpa is coming to school, she remembers the story he told about his father and lying, realizes that she has lied, and rewrites her report. When grandpa arrives, he brings something along that leads Fancy Nancy to believe she got “being fancy” from her great-grandfather. This Fancy Nancy story reinforces the concept that exaggerating (a fancy word for stretching the truth) is really lying. This book also gets the reader to think about how they are related to those who came before them; it is a way to introduce the subject of genealogy and ancestors (a fancy word for people in your family who lived long ago) to the reader. My Family History is another charming addition to the Fancy Nancy series. There is lots of activity under the sea in Barry the Fish with Fingers. The fish are bored, but Barry captivates them with the many things his fingers can do. 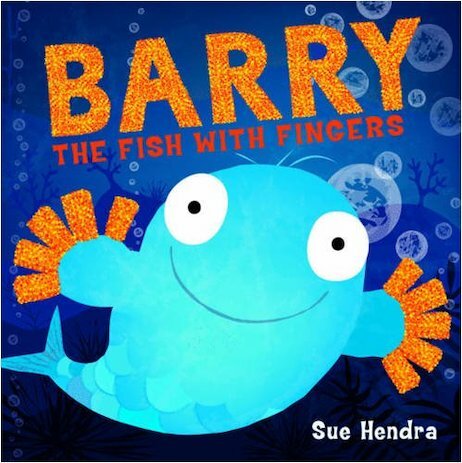 From finger puppets to tickles, Barry’s fingers entertain his deep-sea friends. Barry’s fingers even save his fishy-friends from what could have been a dangerous sea situation. The fish (and readers too) are in for a surprise when a heavy crate falls into the ocean. Life under the sea will never be boring again. This is a funny story to share before a tasty fish sticks dinner. Oscar Ogilvie was happy living with his Dad in Cairo, Illinois. The two loved model trains and had an elaborate set-up in their basement. Then the great depression hit their town and his dad lost his job and left for California to find work. Oscar had to live with his aunt and little cousin in the mean time. The trains were sold to the banker whose bank had taken their home. Oscar was unhappy but he met a drifter who helped him a lot with his homework and became his friend . When the drifter got a job as a night watchman at the bank, he would let Oscar come in to watch the trains after hours during the Christmas season. Then a terrible event happened at the bank and Oscar found himself time travelling on a real train to California with a soon to be movie star. The book was a fun read with lots of time travel and interesting twists. The Hollywood characters won’t mean much to kids but they were a fun addition for me. Oscar is a good character who deserved the happy ending. Good Christmas gift for kids who like to read time travel books or kids who are really into trains or kids who like historical fiction.